Jorge's Place: CD OF THE WEEK: LOOK MA, I'M DANCIN'! CD OF THE WEEK: LOOK MA, I'M DANCIN'! This LOOK MA, I’M DANCIN’! 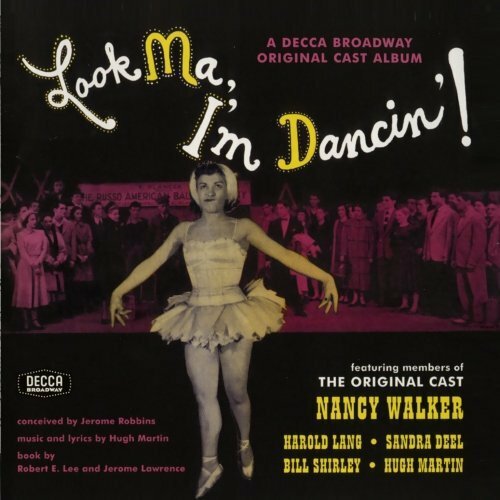 begins with the exciting “Gotta Dance” and its followed by the funny “I’m the First Girl in the Second Row”, the first sung by Harold Lang and the second sung with perfect comic timing by Nancy Walker, who also have a good time with “I’m Tired of Texas”. There are also a couple of melodious songs, “I’m Not So Bright” and “Tiny Room” (both in the vein of MEET ME IN ST. LOUIS, special the last one). The typical 40s musical sound can be heard in “The Little Boy Blues”, “If You’ll Be Mine” and “Shauny O’Shay”. Two previously unreleased tracks, “Let’s Do a Ballet” and “Horrible, Horrible Love”, are added to extra impact and they look like two solid musical numbers. Besides Land and Walker, the cast includes Hugh Martin himself, who shows a pretty voice in “The Little Boy Blues” and Sandra Deel who sings “Shauny O’Shay” beautifully. One last word to Bill Shirley, who reveals a sweet tender voice in “Tiny Room”. This isn’t one of the best scores written for the musical theatre and it’s not Hugh Martins’ best work, but in its own right it’s a pleasant recording and there’s plenty to enjoy here.